The old country house is the ideal location for an unforgettable vacation, suitable for families and small groups: where you can rest and enjoy the fresh and spacious interiors, the shade of the loggia and the scent of the aromatic herbs in the wide garden surrounds That the house. Where you may work, read, write and relax in a peaceful atmosphere, visit the nearby artistic cities, take quiet walks in the woods or a gourmet tour through the many trattorias of the area or even go for a refreshing swim by the seaside or in dive in the crystal clear waters of the local rivers. A house where every detail - from the external stone walls to the antique furniture, the old paintings, the wooden beams of the roof and the traditional terracotta tiles - Gives a unique and cozy atmosphere plenty of authenticity. The main level of the house (the lower one being the private holiday home of the owners, a couple of architects working in Florence) is composed by a large sitting room with a huge traditional fireplace and a big sofa, a dining room provided with a big table suitable for eight to ten persons, two double bedrooms, each with Its Own private bathroom, a studio with two single beds, a separate kitchen with store-room, a loggia and, of course, a big garden dressed with the typical trees , plants, herbs and flowers of the region. La Casina stands alone, Surrounded only by the olive fields and the woods of the property, but ... the village of Radicondoli, With its small shops, ITS commodities and its traditional trattorias, is only 5 min. Walking. The unique and breathless panoramic view That you can have from it's garden and its rooms covers a range of 360 ° from the dawn to the sunset till the far away lights of the small surrounding villages at night. Large villa in the heart of Tuscany. Beautiful area. Lots of space - wonderful kitchen. The roads to Radicondoli are winding, easy to drive, but take time. Siena, San Gimignano, and Florence are close drives. The host provided wine and biscuits upon our arrival - and this was greatly appreciated. Washing machine in the basement is a big plus. Simply the most helpful owner ever. Waited until 0100 in the morning when we finally arrived. Lovely old place with a great walk to the village. Our week in this beautiful villa met all our expectations and more. Francesca and Lorenzo made us welcome from the minute we arrived and let us enjoy the property without intrusion. Radicondoli is a very small town but it had everything we needed as we discovered by wandering into the tiny grocery store and by dining at two wonderful restaurants. The relaxing atmosphere here was hard to leave. We had a most wonderful week here at this lovely villa. Stunning property, total peace and quiet. The view was spectacular. We loved just staying in but did venture into Radicondoli for groceries and dinners out. I highly recommend Agriteca and La Pergola, both had excellent food. Being here was so relaxing, it was hard to motivate ourselves to leave. We loved meeting Francesca and Lorenzo and hope to return someday. Thank you so much for sharing your family property. Thinking Radicondoli looked like it might be a good central location for daily outings throughout Tuscany, we chose this property for a one-week stay. We immediately fell in love with this villa and its location and began trimming down plans to travel out from here daily. This was paradise. We loved the villa, the owners, the peace and quiet and the spectacular view. We could walk/hike or drive into Radicondoli, just up the hill from the villa, buy groceries or have dinner. We ate at Agriteca and La Pergola and loved both of them. We spent as much time at the villa as possible and made ourselves visit Siena and San Gimignano feeling we had to take the opportunity while in Tuscany. For us (three friends), this was everything and more that we could have asked for. We spent a lot of time at the kitchen table looking out the window to the west. Saw spectacular sunsets every night. The villa is surrounded by farmland and we loved hearing the sheep with their cowbells moving from pasture to pasture. If I return to Italy, I would chose to stay here again for the peace and quiet, relaxation and beauty of this location. 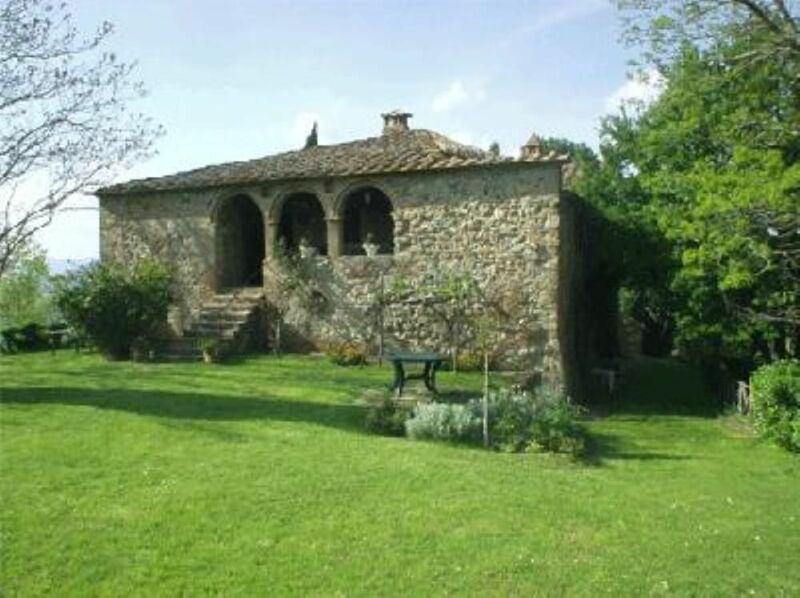 If you are interested in venturing out daily to the smaller towns in the heart of Tuscany - Radicondoli is a great location. But beware- you might never want to leave the villa! There is not a week that has gone by without my mind returning over and over to this stunning property and the wonderful memories we made while spending a blissful week last August at this Villa. Breathtakingly beautiful grounds surround this impressive Villa perched high on a hilltop with magnificent views of the valley and charming village of Radicondoli. The owners, Francesca and Lorenzo, welcomed us upon our arrival and were great to provide us with lots of information about local happenings, wonderful dining options and fabulous day trips. After a restful night's sleep, we began each day sitting on the porch drinking a cup of Italian coffee and planning our day's activities while listening to Vivaldi and soaking in the spectacular views. The Villa is beautifully decorated and offers all the comforts of home. Day trips were spent exploring the regions of Chianti, Montalcino, Pisa, San Gimignano, Siena and Livorno. Dinners at Agriteca and Le Pergola in the village were wonderful as was the Street Art Festival with live music set up on one of the cobble stone streets in the village one evening.